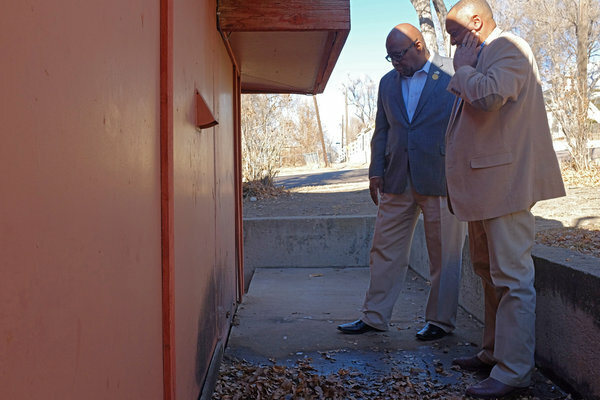 COLORADO SPRINGS — A shadow of char is the only remnant of an improvised bomb that exploded Tuesday outside the local offices of the N.A.A.C.P. here at the feet of the snow-covered Rocky Mountains, jolting the volunteers more accustomed to running membership drives and planning prayer breakfasts. Amy E. Sanders, an F.B.I. spokeswoman in Denver, said it was still unclear whether the N.A.A.C.P. had been targeted, and said the agency was investigating “all possibilities for motive.” Law enforcement officials have said they are looking for a “person of interest” they described as a middle-age, balding white man driving a white pickup truck, but have said nothing else about their search for a suspect. The F.B.I. said the improvised explosive was detonated at 10:45 a.m. Tuesday and had been placed next to a gasoline can, which did not ignite. No one was hurt, and the damage was limited to scorching on the outside of the building. … Sources inside Denver PD informed me that members of the FBI’s Joint Terrorism Task Force were less than enthusiastic about handling the investigation, and that evidence was virtually non-existent. My tweets were met with both approval and skepticism, with many not knowing what to believe. Enter Google Earth, and some eagle eyed web sleuths. Jonathan Langdale, (@jlangdale) web researcher and former USAF image analyst was the first to bring the Google Earth anomaly to my attention. Google Earth indicates that the imagery of the building at 603 South El Paso Street, Colorado Springs, CO was last updated in September, 2014, a full four months before the alleged failed bombing. A preliminary analysis of the Google Earth image side by side with the alleged damage seems to reveal similar scorching on the same area of the building months before the alleged hate crime. Notice how the “crime scene” image has marks above the scorching consistent with the shape and height of the image on Google Earth. I leave it up to you, the reader, to decide. This Google Earth photo is pointed almost 180 degrees opposite of the NYT photo above. In the center you can see the “scorch marks” that were already there before winter arrived.